My old Cheby Silverado lost a unit bearing on a road trip from Utah to Montana once. The problem revealed itself initially with an ABS fault. I found an auto parts store in Bozeman, read the code, and thought surely I could make it home. Nope! I limped it off the highway an hour north of SLC, hoping the wheel wouldn't fall off. I got to spend the night in a hotel and change the unit bearing in a parts store parking lot four hours from home. 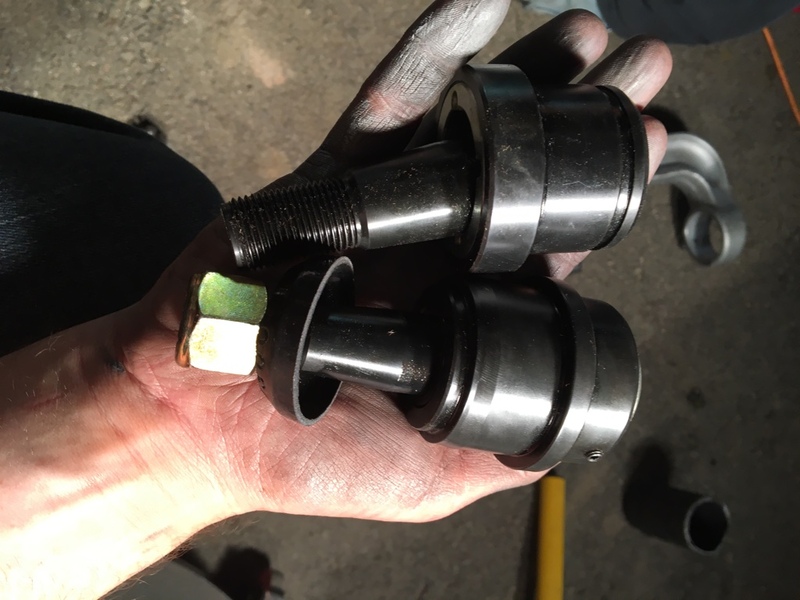 It's probably not a bad idea to have a spare and the tools to change it out with you on such a long trip. Crap, that's great to know Low Sky. What warning signs do you get? Does it go straight to making your wheel wobbly and killing your steering? I've had 3 unit bearings go on two different Chevys. In all three situations, the abs would start acting up at low speed. That was my indicator that one of the unit bearings was going. I would be braking, and slowing down for a red light, and when I got down to about 5mph, the abs light would come on and the brakes would barely work and I would have to veer off to keep from hitting the cars ahead. 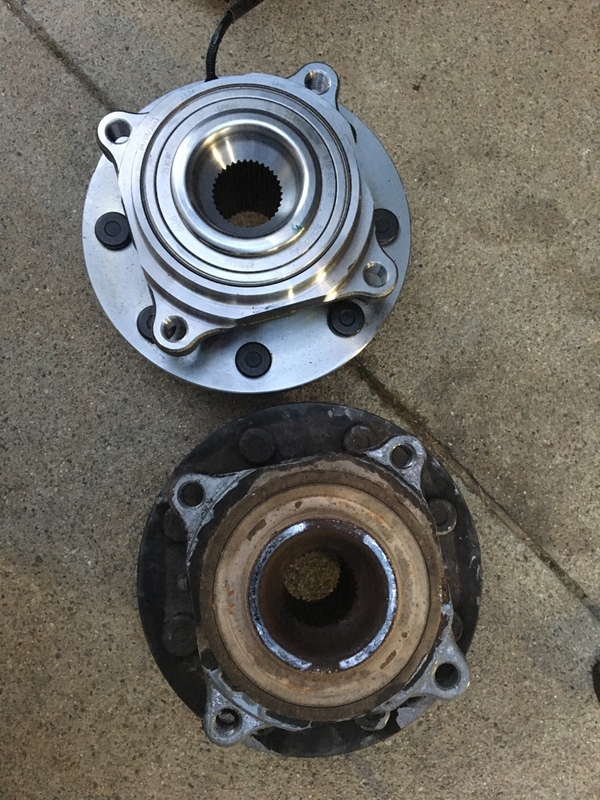 I would replace the unit bearing some time in the next 500 miles and never had a problem other than the abs braking. I never had misbehaving brakes, just the ABS fault (I'm guessing heat killed the sensor). Then I had bearing noise which was worse when turning. The noise kept getting worse and eventually I started feeling it in the steering. ABS fault light to total destruction in ~350 interstate miles. 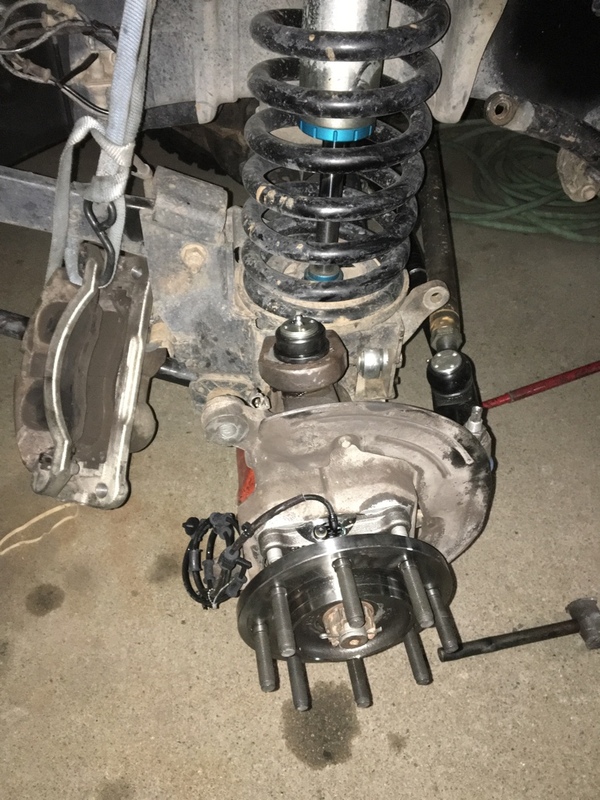 I'm going to give a shout out to Paul at CJC for giving me some great technical advice on ball joints, giving a down to earth opinion on the joints I wanted and for forcing me to watch a video of him doing BJ's. Also for trying to find me a unit bearing. To tgibbs on DTX for letting me come over at 9pm on a Friday and working nonstop with me until 2am to swap ball joints with his tools and for giving me good advice and teaching me a few things in the process, and trying to find me a unit bearing. And to the Mopar steering stabilizer, that with 160,000 miles and three rock strikes and a leaky seal somehow stopped me from getting death wobble so that I could drive 60 miles on the freeway to Tristan's place when I couldn't make it five miles on the street without my tires shaking off the ground without the stabilizer. It's a little darty now but that should go away as the joints break in. It was already feeling better on the drive home. Funny enough I still got death wobble on the way home with a few bad freeway sections so I still have a few things to check out, but it was nowhere near as bad as before and it went away on its own. I'm pretty happy. DamageWagon wrote: and for forcing me to watch a video of him doing BJ's. I don't think I want to watch a video of Paul doing BJ's. You are the man. That is not an easy job. I am not envious of it. Glad you managed to get that worked out before your trip. Hey question about your sliders, I assumed they aren't finished yet? You installing rails in-between the outside rails? Thanks Mike, it was definitely easier than I imagined but having a buddy who has done them and has a nice BJ press made a big difference. Ive had the brake/rotor assembly off more times than I care for now. The sliders are not done, you are correct. I want to add short support tubes between the rectangular tube and the nerf tube. 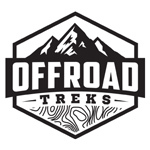 There's no way I'm getting done in time for the trip though, that is just how they will be during Moab I think. 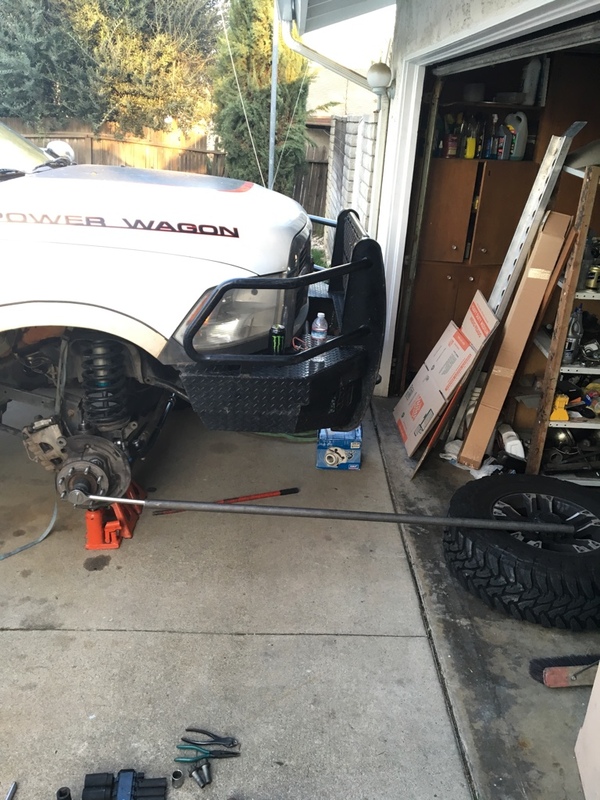 In addition to the bearing I also still had death wobble after changing ball joints. At this point I was running out of things to check, so I decided to do a driveway alignment. I go to line the truck up straight, look at both tires and realize HOLY CRAP they're pointed at each other! Hop under with a tape measurer, 1.25" of toe-in. Holy crap no wonder I have DW! The tires are fighting each other to death! 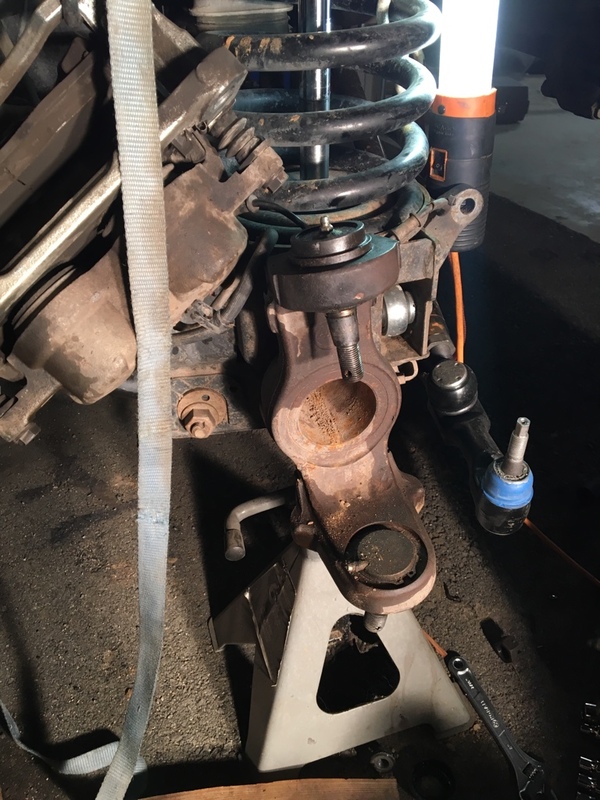 Funny I never felt anything odd when my ball joints and tie rod and drag link were all shot, maybe massive toe is the pro method to make you feel nothing? So I adjusted that to 0.125" toe and it drives with no wobble. I'm glad the bj's went well, I had a feeling you'd knock it out relatively easy, good job! Nice job on the repairs! Your in for a much safer trip now hahahah. Im sure you did, but hopefully you used liberal amounts of anti-seize when reinstalling everything. olyelr wrote: Nice job on the repairs! Your in for a much safer trip now hahahah. Im sure you did, but hopefully you used liberal amounts of anti-seize when reinstalling everything. I used a California Liberal amount of anti-seize on everything. 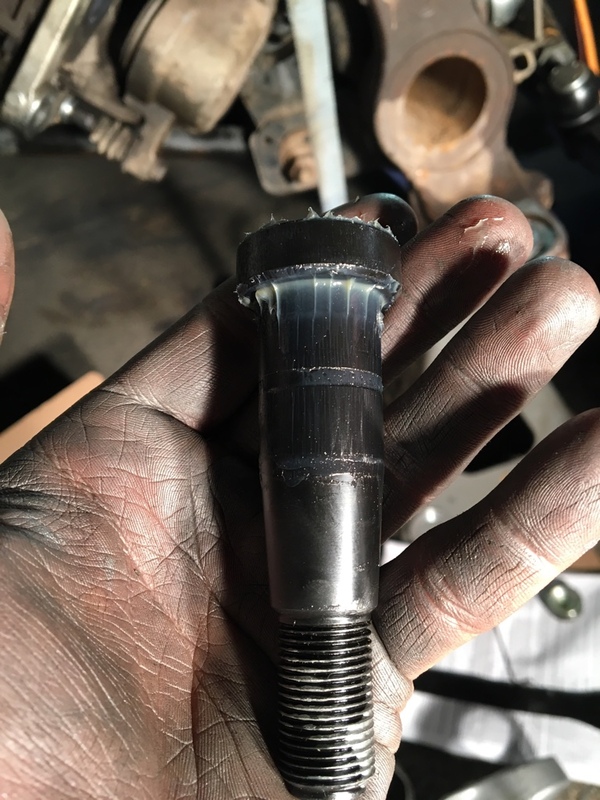 Every bolt on my truck gets either anti-seize or loctite. If I have to spend four hours with s hammer and a torch and a key bar to get my front end disassembled, I would prefer to spend about five minutes the next time. Exactly! Nothing worse than an hour job takkng 3 because of stuck bolts/parts. What was causing the rough idle? 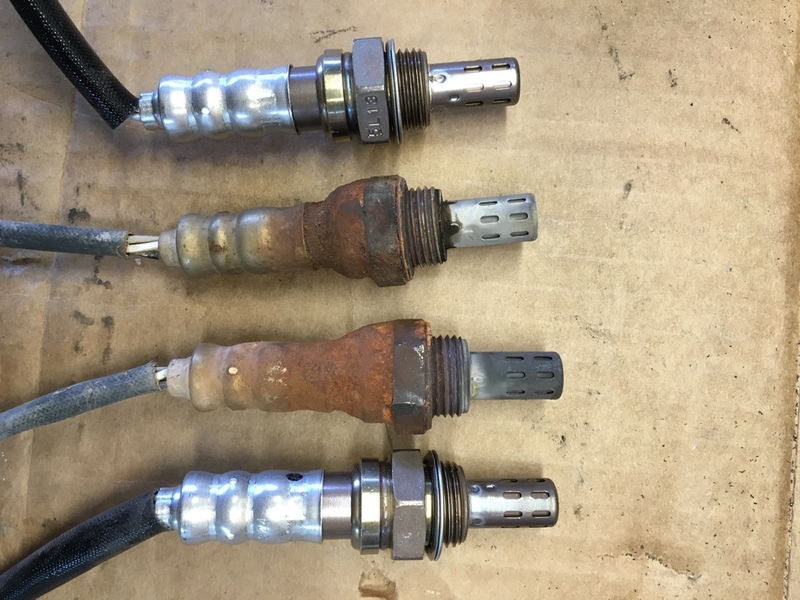 Did you know that, when you pull your valve cover and bump an AC line and leak all of your refrigerant out, that your electric fan no longer works? Yep, the electric engine fan is controlled by the CANBUS and a required setting is for the AC system to have a certain pressure inside it for that fan to run. So I'm towing with no electric fan, although it hasn't mattered. I made it up the Grapevine no issues. Going to get it fixed before we start our trip since it's the low speed stuff that the electric fan plays into. Nice timing with the AC bust! Just as it got hot as balls out here again! I feel your pain, we bumped a line on my dad's old megacab a few years back right before a turnaround trip to haul a trailer back from vegas... mid July. Leather seats, 110*, and Vegas Sunday traffic was not a good time! DamageWagon wrote: Did you know that, when you pull your valve cover and bump an AC line and leak all of your refrigerant out, that your electric fan no longer works? Yep, the electric engine fan is controlled by the CANBUS and a required setting is for the AC system to have a certain pressure inside it for that fan to run. So I'm towing with no electric fan, although it hasn't mattered. I made it up the Grapevine no issues. Going to get it fixed before we start our trip since it's the low speed stuff that the electric fan plays into. The electric fan is for the AC, the compressor isn't going to run without line pressure so the fan will default off. I'm glad you got the engine sorted, the cam diagnosis sounded iffy. @Reloader, what I noticed was that the low speed fan is controlled only by the AC system, but the high speed fan is triggered by the thermostat. My truck hit 221 degrees a few times but then would immediately begin cooling and would never go above 219 again due to the electric fan being on. It's nice to know I still have reserve cooling. I am sick and tired of death wobble. I need some opinions. So the DW came back, probably a dozen times with the trailer loaded and probably 50 times so far with the trailer unloaded or no trailer. The steering stabilizer is keeping it on the road but I'm pissed off and need it fixed. I have not been able to get an alignment since we keep having to stay on the road. Currently in Coeur d'Aleine. 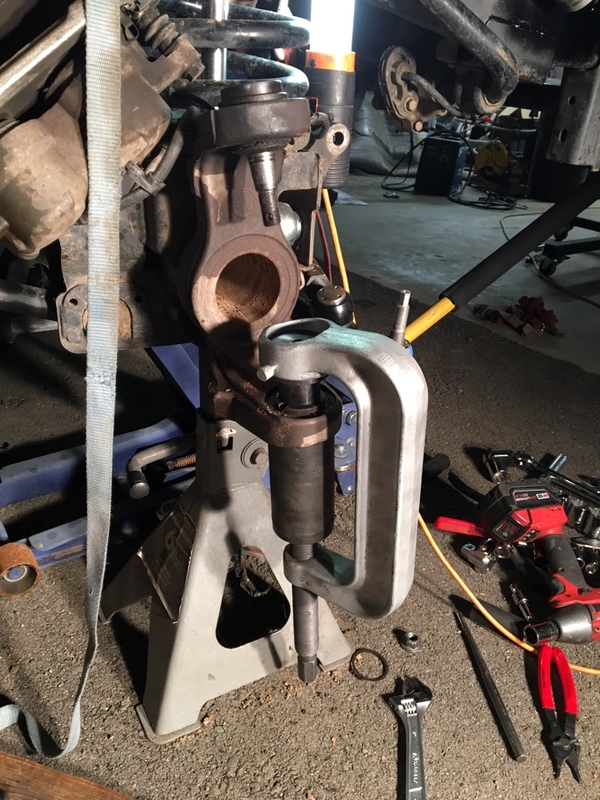 - old style Carli Trackbar, bushing appears to move about 1/16"-3/32" using power steering driveway test. New heim. I had the girlfriend turn wheel side to side with engine on and crawled underneath. 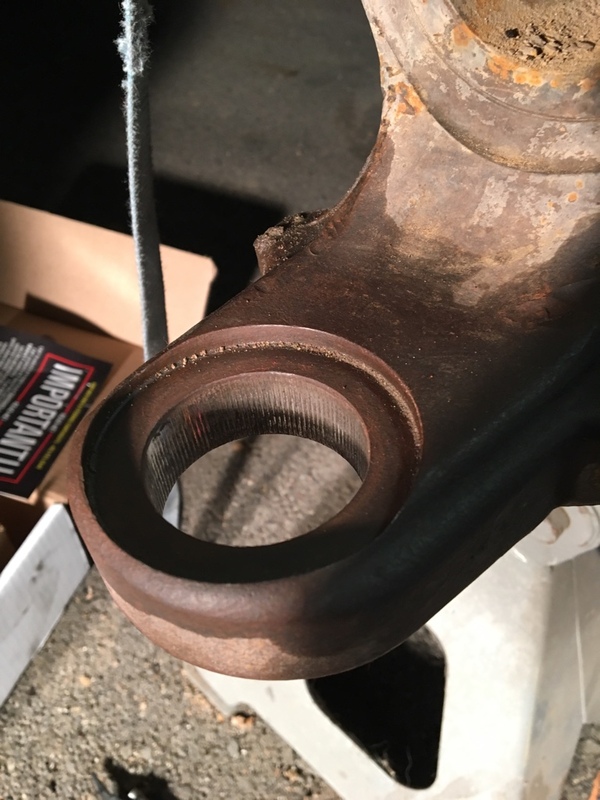 I couldn't see anything moving or popping, only the Trackbar bushing had any movement but even it seemed like 1/16" or so. I can turn the steering wheel a little bit before it takes slack, I think that's the steering u-joint that's right by the firewall? Gearbox looks tight, maybe it isn't original. - Trackbar bushing may be shot. I compared the bushing housing ID to the dimension Aaron sent me after the Thren bushings didn't fit and my bar is 0.025" oversize. Don't think it should be that way but I don't know how it would enlarge like that. It is round, not ovaled. - NAPA tie rod. It is a greaseable bar. Maybe the TREs are dry and the grease is supposed to fill a void? Is your girlfriend sick of your truck yet? Reloaderguy wrote: Is your girlfriend sick of your truck yet? I don't think the lower BJ should have up/down movement. The upper will show up/down through the turning cycle. It really just acts as a pin. My next thought would be track bar bushing, then control arm bushings. This order is simply due to cost and ease of replacement. A true alignment may help, too.